Tangmarg: He took part in the funeral of a local militant of Hizbul Mujahideen in May 2016. He had faced detention at a police station in 2009 for being part of ant-India protests. On Thursday, 25-year old, Bilal Ahmad, turned up at the Batpora polling station, which lies on the highway in this tourist town, to cast a vote "to end excesses by government forces in Kashmir". The road outside the polling station that saw 74 people, including 11 women, turn out to cast their votes from among 878 eligible voters, had seen massive protests following the killing of Burhan Wani in July 2016. But as the sun beat down on the children who played in a nearby ground, people trickled into the polling station. Across the main tarmac road, the brother of local Hizbul Mujahideen militant, Bilal Ahmad Bhat, reminisced that people turned up in massive numbers for his funeral in May 2016, when he was killed after falling from a hill while crossing the border in the Poonch area of Jammu. His two other associates had surrendered. The militant was active for over a year before his death and had taken up arms after graduating while he displayed his inclination for "freedom" from very early on, said Sajad Ahmad Bhat. "Bilal used to lead the prayers for many years at a local mosque and was sympathetic towards separatists before he took up arms," he said. But the voter queues here were in contrast to the solidarity that the people had shown with the militant's family and the protests after the civilian killings following Burhan's death. In Tangmarg, in the backdrop of snow-capped mountains, voters walked up to the polling stations past the heavy patrol of the forces. 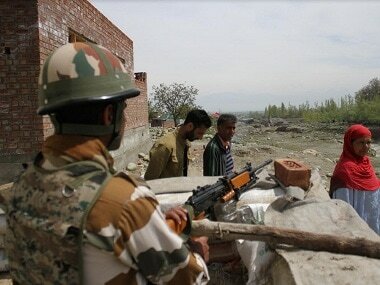 Elsewhere, in the northern Kashmir constituency of Baramulla, polling that began on a dull note picked up during the day. 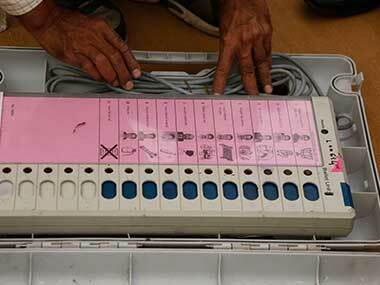 By 1 pm, the polling percentage in the districts of Baramulla, Kupwara and Bandipora was 15.1, 30.8 and 20.9 percent respectively. Two hours later, the percentage was 19, 38.7 and 26.1 percent respectively. 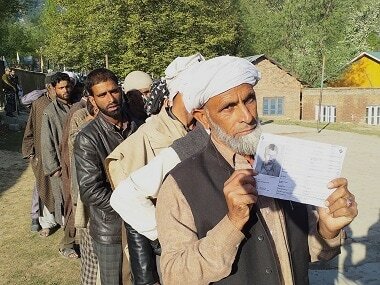 The people, including women and the elderly, turned up to vote amid a shutdown in most of the parts of the region as well as in Kashmir in response to the call given by the separatists to boycott the elections. The voters said they cast their ballots for change: To ensure development and reject corruption. But the common reason that the people gave was that they voted for an end to "atrocities by government forces in Kashmir". "The authorities are harassing us. The police is randomly arresting youths. We want this to stop and I repose faith in the candidate for whom I have voted," said Bilal. 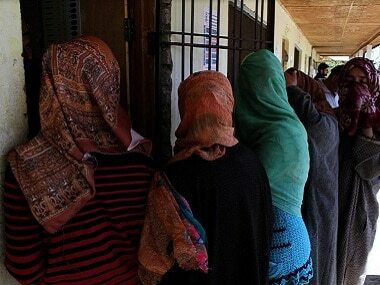 Women made their way through an iron gate to cast their vote at the Kunzer polling station, where armed forces personnel watched the movement of people closely. Those donning headscarves and some of whose wisps of grey hair showed up queued outside the polling station to cast their votes. By 11 am, the votes polled at Kunzer were 128, which rose to 173 within a few hours from among the 650 who were eligible to vote. Manzoor Ahmad Shiekh, 24, who was arrested for being part of the anti-India protests following the killing of Wani, said he voted to "reject those who promoted massive corruption in the employment of favourites". "Those who were highly qualified were left out of employment in government departments," he said. His view was supported by another voter, Shabir Ahmad Shiekh, who said that he voted also "to ensure that there was development through the building of better infrastructure". 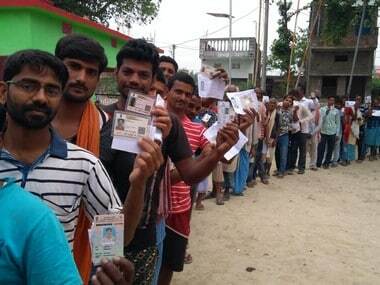 The turnout that was low when polling started, began to pick up at the Ferozpur polling station. 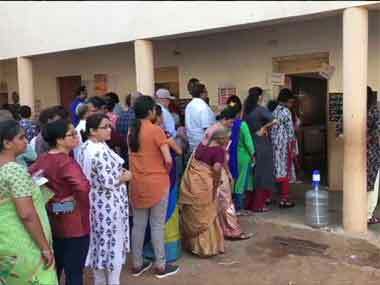 By around 10.30 am, as many as 79 votes were cast of the total 956 at one polling station, while at another, the polling percentage was 17.9 from a total of 932 people who were eligible to vote. "We have voted for change. We were witness to the excesses that were committed on the people during PDP-BJP rule. Hundreds of youths were blinded through the use of pellet shoguns. President's Rule is martial law, which should end," said Hilal Ahmad Shah, 30, who works as a private teacher. Talking about the recent decision of the government to ban civilian traffic on the Srinagar-Jammu highway for two days a week, he said that "it was nothing but draconian".